Addis Ababa – Migrants looking to reintegrate into their home communities face a range of challenges, including a lack of marketable skills, limited access to finance and recruitment channels, and inadequate support systems. 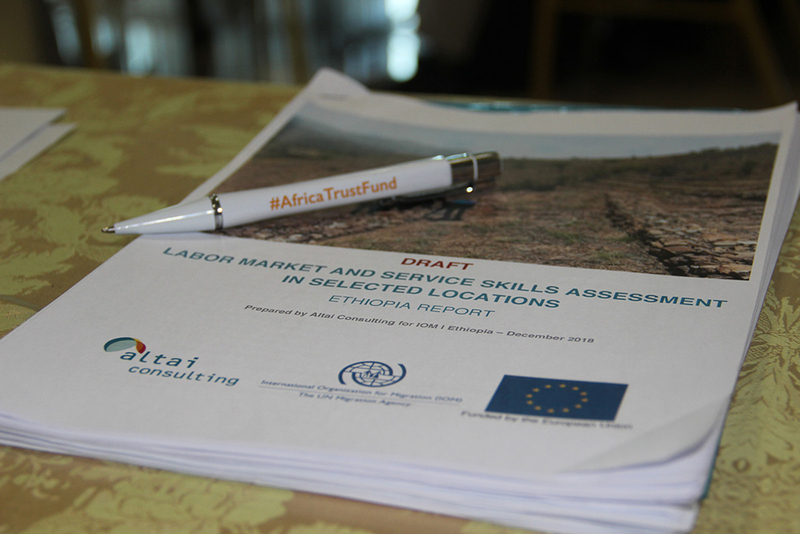 This is according to a new Labour Market and Service Skills Assessment report, compiled with funding from the European Union under the EU-IOM Joint Initiative for Migrant Protection and Reintegration in the Horn of Africa. Also known as just The Joint Initiative, the project facilitates orderly, safe, regular and responsible migration management through the development of rights-based and development-focused procedures and processes concerning protection and sustainable reintegration. It is backed by the EU Trust Fund and has been set up in close cooperation with a total of 26 African countries. The Labour Market and Service Skills Assessment report follows a study conducted in Ethiopia and Somalia by Altai Consulting, an independent consulting company. The Ethiopian segment of the research was undertaken in Amhara, Oromia, Southern Nations Nationalities and Peoples’ Region (SNNPR) and Tigray regional states. The assessment took place among migrants who returned home before the Joint Initiative was launched. The Joint Initiative is currently planning to scale up its activities in 2019, with several partnerships and collaborations in the pipeline, and will use the findings from the assessment as a baseline. The report notes that harsh economic conditions and high levels of unemployment are the primary driving factors for irregular migration in Ethiopia. The country is a major country of origin and of destination for migrants in the East and Horn of Africa. However, many migrants do not make it to their intended destinations: they are either stranded in transit countries or are simply unable to endure the harsh conditions that irregular migration entails. Very often returnees head back to their home countries worse off than when they left, both economically and psychologically. The report notes that returnees need to be provided with marketable skills through market-driven training and internship programmes for them to successfully enter the job market. It is also indicated that linking Technical and Vocational Education and Training (TVET) Institutions with the private sector is critical to matching labour demand with supply. Upon returning home, migrants are also often interested in starting their own businesses. However, lack of start-up capital is their primary challenge. According to the assessment report, 74 per cent of the returnees interviewed were unable to borrow money, and only 6 per cent of those able to do so received money from financial institutions. Government agencies, TVETs, graduates, local and international non-government agencies (NGOs), private businesses, returnees, community leaders and youth representatives were surveyed for the study. The assessment was meant to identify effective responses to the reintegration needs of returnees, while also looking to enhance their employability and their entrepreneurship capacities. The research recommends increased coordination between TVETs and microfinance institutions. It also suggests that partnerships with NGOs be explored to facilitate the payment of interest on borrowed funds and recommends scaling up public recruitment channels as a way of alleviating the difficulties experienced by returnees in accessing employment opportunities. Close cooperation with TVETs, increased use of the internet and social media platforms for urban settings and public notice boards for rural areas are among the suggested remedies. With regard to sustainable reintegration, the report recommends that social and psychosocial components of reintegration be addressed as well.